The world of Margra is a desolate wasteland after one of its moons shattered. Factions fight over resources as pieces of the broken moon rain down, bringing chaos, destruction and death. Dragon wine is a life giving drink imbued with the essence of dragons. It is what keeps people alive. But the prison vineyard where Salinda works to grow grapes is in jeopardy. Not only does the Inspector, the sadistic ruler of the prison vineyard, make her life and the life of others a misery, he wants to rule the world by hoarding all the dragon wine. But Salinda has a secret power, an ancient gift called a’ cadre’, that may one day save the world. is failing, and it’s in this fantastic setting that several characters try to survive and accomplish their own goals, from restoring vitality to the world to learning about the age and the role that dragons have to play in this critical time. 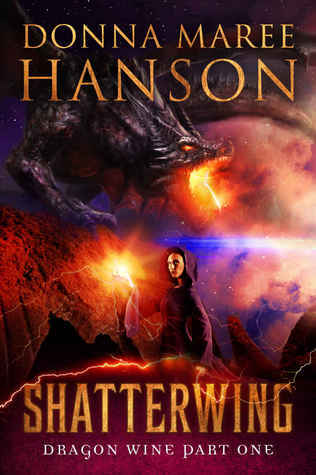 Donna Maree Hanson has created one of the most unique fantasy settings that I have run across in my recent reading. The book has different plot threads that start to interweave in this environment, each one involving different characters. As the tales continue, the reader learns more and more about the world and the danger that it suffers in its current state. The ideas presented are ambitious and are very reminiscent of the writings of Anne McCaffery. The main characters are developed well, though it becomes obvious that this world is not a kind one very quickly. My main contention with this novel is that it is indeed a start to this tale, but there’s no real resolution at the end of the book. Obviously there are more books in this series, which explains why things stop in the middle of a couple of different arcs. Personally I wish that there had been even a temporary sense of resolution at the end, and I have to wonder if people who start in the middle of this series will have all the information required to catch everything. But the book is worth a reading and some consideration, based on that environment alone.